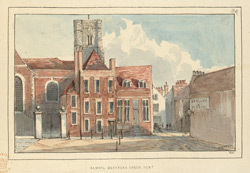 This watercolour depicts Deptford Green as it appeared in the mid 19th century. Dr Breton's School is positioned at the centre of the image. Deptford Green was originally a small fishing village. The church of St Nicholas, seen to the left in the picture, had to be enlarged in 1697 to cope with the steadily increasing local population. Dr Breton's school was built in 1707 with funds from the former vicar, and became Deptford's second charity school. The blue sign seen to the right in the picture is of the brewery firm Barclay and Perkins (now part of the Courage company). The firm was well known in the 18th and 19th centuries for its rather strong "Imperial Russian" beer, so called on account of it being readily consumed by clients in the Russian Empire.